Season’s Greetings, indeed! It doesn’t have to be Christmas to throw greetings out to passers-by! 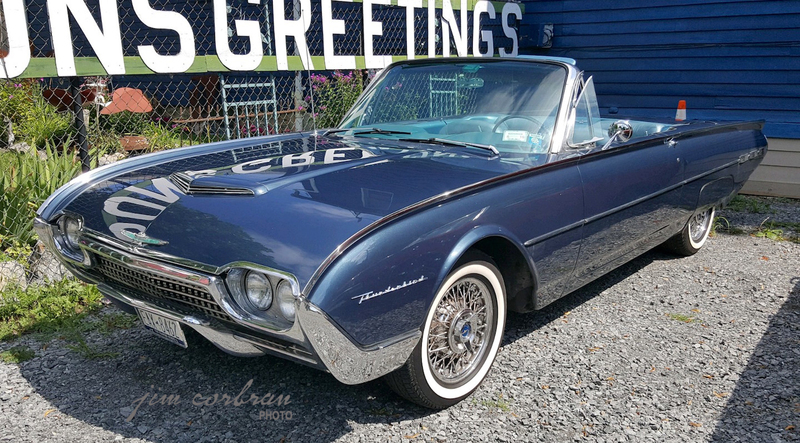 A Buffalo West Side yard was the backdrop last summer for this gorgeous 1962 Ford Thunderbird. Its wire wheels contrast nicely with the Caspian Blue paint job, and the never-seen-on-a-new-car-these-days blue interior is very inviting. If ordered from the factory, those wheels were a $373.30 option, which doesn’t sound like much today, but remember that the MSRP on the ’62 T-Bird convertible was just $4,788!